Mr. Duey Class Dis-Missed CD. I'm willing to bet that nearly all of my fellow 40-ish crowd remembers Schoolhouse Rock, right? Those fun educational snippets stuck in between Saturday morning cartoons. (Because much to my children's horror, that's the only time during the week that cartoons were available.) Anyway, I, for one, absolutely loved Schoolhouse Rock, and I definitely learned from the catchy little songs as well. I can still to this day recite the Preamble to the Constitution thanks to good old Schoolhouse Rock. But why am I talking about Schoolhouse Rock when I'm supposed to be reviewing Mr. Duey Class Dis-Missed? It's just that I simply can't help but think back to good old Schoolhouse Rock, when I listen to this CD...the similarities are obvious. But then again, they are two very different creatures. Mr. Duey Class Dis-Missed is an educational CD aimed generally at the upper elementary and possibly even at the middle school set. It contains 17 songs, covering a wide range of subjects...everything from integers to adjectives to atoms to the branches of government. Our family has listened to this CD a few times now. In general, the reviews are positive. The kids seem to enjoy it a great deal more than Rich and I do. But that's both understandable (as the musical genre is rap, a type of music neither Rich nor I enjoy) and okay (as the CD isn't aimed at adults, but at kids). And despite the fact that Rich and I don't particularly enjoy listening to it, we both definitely see its educational value. In fact, Rich even plans to play a number titled "Cells" to his non-majors biology class both for fun and because they may actually pick up something from it. 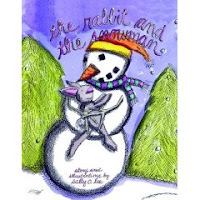 The Rabbit and the Snowman by Sally O. Lee. The boys (aged 5 and 7, as most of you know) and I have some differences of opinion on this one. Gray and Max both really enjoyed this story. I, on the other hand, found it lacking that special charm I want to experience with a picture book. It is a story of a snowman built in the woods by a bunch of children one snowy day. But the children go home at the end of the day, and never come back. The snowman can't help but wonder what is wrong with him that all his friends would desert him. Then he meets a rabbit, and the two of them become friends and enjoy one another's companionship until spring. Then, of course, the snowman melts. And the rabbit is left wondering what is wrong with him that his friend would desert him. When winter rolls around again, the snowman reappears, and he and the rabbit pick up where they left off. They talked about how the snow made a crunchy sound when it was a few days old. And how the sun trickled through the trees to make streams of light. They talked about how the birds made their nest high in the trees so that no one could find them. They talked about how the stars lit up the sky when it was dark. But much of the book felt quite choppy to me. It also didn't "feel right" to me how the snowman just reappeared the next winter. When I asked the boys if this bothered them, Gray replied, "Mom, haven't you ever heard of magic?!!" Guess he put me in my place, huh? Bottom line, the boys (target audience) loved the story but didn't like the art. Mom not impressed with the story, but found much of the art perfectly delightful. And finally, in one of those last but definitely not least situations, we have this wonderful picture book. I ordered this one on Becky's suggestion. 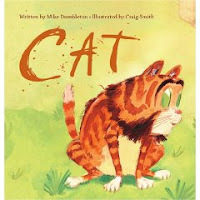 This book was perfect for Max in so many ways, not the least of which, of course, was because it featured a cat! The story was simple, but very cute! And it was written at the perfect level for Max to read. He hasn't picked up reading nearly as easily as his older brother and sister did, but he enjoys it very much. It's always gratifying to find a book that challenges him without frustrating him. And in addition to all that, the artwork by Craig Smith is positively wonderful! Bottom line, this was our favorite of all three of these kid offerings! Max and I were in complete agreement that this book is a definite winner! Lovely site - thanks for the reviews! I'm always on the hunt for great children's books and have recently discovered Bayard and their series of StoryBoxBooks, AdventureBoxBooks and DiscoveryBoxBooks (which is a special Olympic edition) They have work by acclaimed children's books illustrator Helen Oxenbury appearing in the Storybox series for September. In addition to this, they also have some great activities for rainy days: http://www.storyboxbooks.com/potatoprinting.php, http://www.adventureboxbooks.com/macaroni-picture-frames.php, http://www.discoveryboxbooks.com/skittles.php Enjoy!